This stage of training creates the foundation for protection. Upon completion of this level the dog will intimidate and bark on command at the target person. This is established via the game of tug which is used to unleash the naturalistic drive of the dog. This level focuses on building on associations / commands. Speaking on command. Introductory quarry agitation work. During this stage the dog stays onsite for 14 days of intensive one on one training. Level Two Protection transitions the dog to the bite sleeve while unleashing the dog's defense drive. This stage represents a higher level of response, focus and control. During this stage the dog stays onsite for 14 days of intensive training. 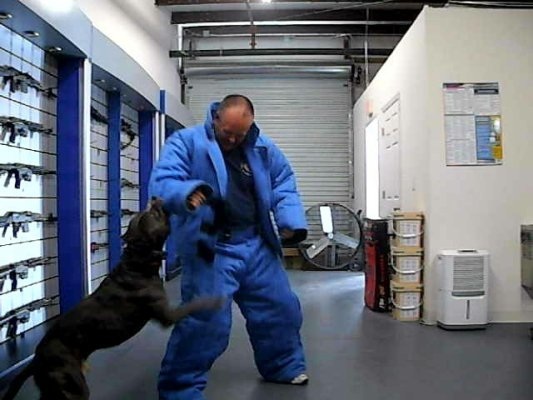 Level three transitions the dog from the exposed sleeve to the hidden sleeve and the full body bite suit. This level consists of advanced role playing scenarios which establishes a reliable and dependable protection ability. During this stage the dog stays onsite for 14 days.